Housing industry experts say fewer people are moving and more people are remodeling their existing homes. And most people start with remodeling a bathroom. When you're considering a bathroom re-do, you'll need to decide what kind of flooring to use. What is the best flooring for a bathroom? Here's an overview of the best (and worst) choices for a bathroom floor. Have you ever gone into the bathroom at someone's house and been greeted with that unmistakable fragrance of soggy nylon and mildew? Betcha they had carpet, right? Carpeting is a tricky floor covering in any room, but in the bathroom, it's nothing short of disastrous. Shower splashes, soggy feet, wet towels and umm, well, missed aim, shall we say, all come together to make bathroom carpeting one of the worst ideas ever. Sure it feels good on bare feet, but the trade offs just aren't worth it. In theory, if it's perfectly sealed , you could use hardwood in a bathroom. But that's only in theory. In real life, the wood is never perfectly laid, nor perfectly sealed, and that means water and moisture can get down into the wood. The result could be rot, splinters and warping. And ultimately, the need for a new floor. Like the hardwood, laminates should be a fair choice for a bathroom floor. I say "should" because although modern laminates are sealed, easy to install, durable and less slippery than earlier designs, even a small chip or open seam in a laminate floor could allow water to enter, making the floor bubble and buckle. That would mean a new floor. Keep laminates for less watery locals like family rooms, hallways or even kitchens where they perform exceptionally well -- they are just not the best flooring for a bathroom. For that, we need something better suited to water. 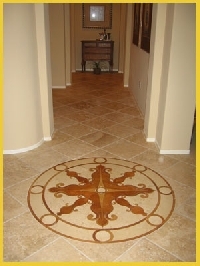 Stone flooring is elegant, it stands up well to water, and the color is rich and varied. Choose a textured stone to reduce slipperiness -- always an issue in a bathroom where safety is so important. Adding an underfloor heating system will take away the chill -- sometimes a concern, especially in winter. The one drawback is the price. A quality stone floor is probably the most expensive choice of all. But if the budget permits, and you are looking for a dramatic floor that's a natural match for water, stone is your best choice. According to most remodeling experts, tile is the best option for bathroom flooring. Affordable, easy to install, easy to care for and able to stand up to moisture, tile is a great choice for your bathroom. As with stone, make sure you select a textured tile to avoid slips and falls. An economic alternative for bathroom flooring is vinyl. Vinyl tile comes in hundreds of colors and textures and is easy for even a beginner to install with few tools. Sheet vinyl is harder to install, but may give a more uniform and professional look, especially in a larger bathroom. No matter what you choose, the best flooring flooring for a bathroom starts with careful measurements, a well thought out plan for your decor and (ideally) professional installation.